More exciting news for DRS2018 delegates. 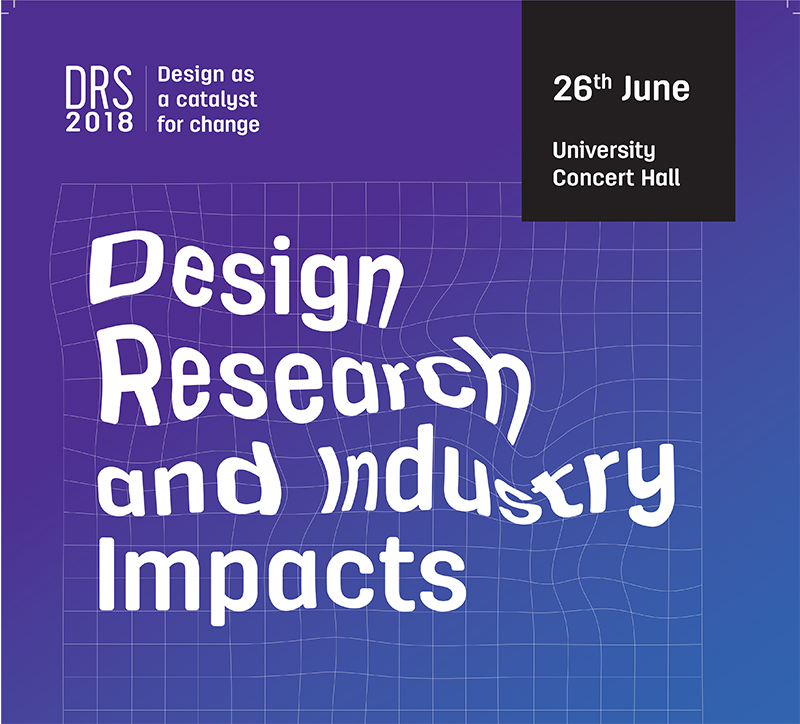 The second DRS2018 Keynote Debate 'Design Research & Industry Impacts' explores the changing nature of design research and practice within academia and industry. Design is moving beyond merely being an instrumentalised tool for industry, and becoming an altruistic agent for, and of, change as well as a force for social innovation. The role of design research, and design researchers within this 'world beyond' is prompting a change of perspective from both academia and industry. A new generation of designers are challenging the evolving role, and nature, of design research for both practice and industry; questioning whether design research is a tool for industry or an agent for social and cultural change, or if it can be both. This debate will explore the changing nature and context of design research and practice, pointing toward the implications of this change for realising impact. What is needed to support these new design research principles and emergent practices, and how design researchers can pursue new impactful research pathways that truly engage wider society. With multinationals opening design-led, multidisciplinary R&D hubs to explore how digital and emerging technologies transform businesses and society, does academia need to look at how education can engage more collaboratively with industry-led research to make innovation real? Impact has always been a consideration for design researchers, but it is only recently that a more explicit and systemic monitoring and measuring of impact has emerged - due to the economic downturn the impact of design research, and in particular government funded research, has come under increased scrutiny. Can we develop ways of measuring the value and impact of research within the design process, and successfully demonstrate economic, societal, healthcare, environmental and political impact? Designers are increasingly working collaboratively, in a research-led way, on trans-disciplinary projects. Designers are advocating and lobbying for change, linking with social and political processes and documenting and sharing best practice. How we can the design eco-system support the development of design-led research communities that collaborate, co-generate knowledge and achieve collective impact on complex issues? Prof. Alex Milton will bring his expertise to bear by moderating this debate. Alex is a Professor and Head of School of Design at the National College of Art and Design, Dublin (NCAD), having returned to the institution after undertaking a sabbatical in which, as the Programme Director of Irish Design 2015 (ID2015), he successfully devised and delivered a government backed programme that attracted 1.7million exhibition attendees and established a platform for the continued development of design in Ireland. As a designer, curator, author and academic, Alex has advocated for the pivotal role of design – be that through public engagement, cultural interventions, curriculum innovation or policy development. He has curated major design exhibitions across the globe including ‘Liminal - Irish Design on the threshold’ shown in Milan, New York, Eindhoven and Dublin, as well as developing exhibitions with the V&A, Design Museum London and Vitra Design Museum. He has written a number of books including ‘Product Design’ (Laurence King, 2011) and ‘Research Methods for Product Design’ (Laurence King, 2013). His most recent book 'Irish Design 2015 - Making Design Matter' was published in December 2016. A former Head of Design & Applied Arts at Edinburgh College of Art, he has taught and managed at institutions across the globe including Heriot-Watt University, Edinburgh Napier University, University of Dundee, Central Saint Martins and the Central Academy of Fine Art in Beijing. He has been a Visiting Professor at Manchester Metropolitan University and Aston University, and was the Director of Design Research at University College Dublin. Lorna Ross, Mariana Amatullo and Paul Rodgers will debtate the topic under Alex's moderation. Lorna Ross’ design career has been an remarkable journey spanning almost 30 years, with stops in the world of fashion, wearable technology and, most recently, health care. She is a futurist at heart, recognised for her ability to anticipate shifts in the social, cultural and economic context for design. She was one of the pioneering researchers to focus on wearable technologies and built a reputation for research activity in this arena. She later identified the theme of health as an emerging arena for design to thrive. She founded and led the Human Wellbeing Group at the MIT Media Lab. Her vision was to employ human centred design principles to address the biggest challenges facing the healthcare industry in delivering population health outcomes. She returned to Ireland in 2017 after 26 years in the USA to take up the position as the Group Director at Fjord Dublin. As the Fjord studio in Dublin sits within a global Accenture centre for innovation, The Dock, Lorna has a unique role placing design at the heart of the multi-disciplinary teams working on emerging tech R&D, specifically the commitment to the responsible humanizing of these technologies. Paul A. Rodgers is Professor of Design at Imagination, Lancaster University. He has recently taken up his 3-year post as the Arts and Humanities Research Council Leadership Fellow for Design in the UK. He is one of the four founding members of the Design Disruption Group who strive for positive change in health and social care and elsewhere. Mariana Amatullo is an Associate Professor of Strategic Design and Management at Parsons School of Design, The New School, New York. She also serves as the co-chair of the Management initiative at The New School, a university-wide effort developing an integrated approach to the conception and delivery of new interdisciplinary research, external partnerships and curricula and co-curricular projects focused on a new vision of management education for the 21st century driven by principles of design, creativity and social justice. Amatullo joined The New School in August 2017 after 16 years at ArtCenter College of Design in Pasadena, California, where she co-founded and led its award-winning social innovation department, Designmatters. As a practitioner-scholar, Amatullo has extensive expertise managing a portfolio of international and national educational projects, research initiatives and publications at the intersection of design, design management and social innovation. Her research engages broadly with questions pertaining to the agency of design in organizational culture; current studies are investigating design and innovation initiatives at UNICEF as well as the adoption and impact of design methodologies in the public sector. Amatullo lectures internationally about design and social innovation and serves on a variety of executive and advisory boards in design and the arts, including CUMULUS, the International Association of Colleges and Universities of Art, Design and Media. She is the recipient of the inaugural 2012 DELL Social Innovation Award for Outstanding Social Innovation Education; she is Fellow with the Royal Society of the Arts and a Scholar-in-Residence at the Weatherhead School of Management, Case Western Reserve University. Amatullo is the lead editor of LEAP Dialogues: Career Pathways in Design for Social Innovation (with Bryan Boyer, Liz Danzico and Andrew Shea, Designmatters/DAP, 2016) and recently published an open-source digest of the book: LEAP Dialogues: The Educator's Guide (Designmatters, September 2017). Her dissertation “Design Attitude and Social Innovation: Empirical Studies of the Return on Design establishes the first quantitative metrics in the literature that demonstrate the statistical significance of design capabilities in the context of social innovation aims. She holds a Ph.D. in Management (Designing Sustainable Systems) from Case Western Reserve University; an M.A. in Art History and Museum Studies from the University of Southern California, and a Licence en Lettres Degree from the Sorbonne University, Paris, where she also studied Art History at L’Ecole du Louvre. A native of Argentina and the child of a diplomat, Amatullo grew up around the world.